Here at Lickteig Family Eyecare, we believe that every member of your family deserves the healthiest eyes and clearest vision possible. If you feel the same way, then you'll want to schedule eye and vision exams from our clinic's optometrists. Let's look at why these evaluations are so important and how we use them to help you maintain your ocular well-being. Regular eye exams, including annual checkups for most school-age and adult patients, should be a normal part of your life. Even if your vision seems fine to you at any given time, your eyes could be experiencing the early stages of chronic disorders and diseases such as glaucoma, cataracts, macular degeneration or diabetic retinopathy. These diseases typically don't cause symptoms until they've already done permanent damage to your eyes. 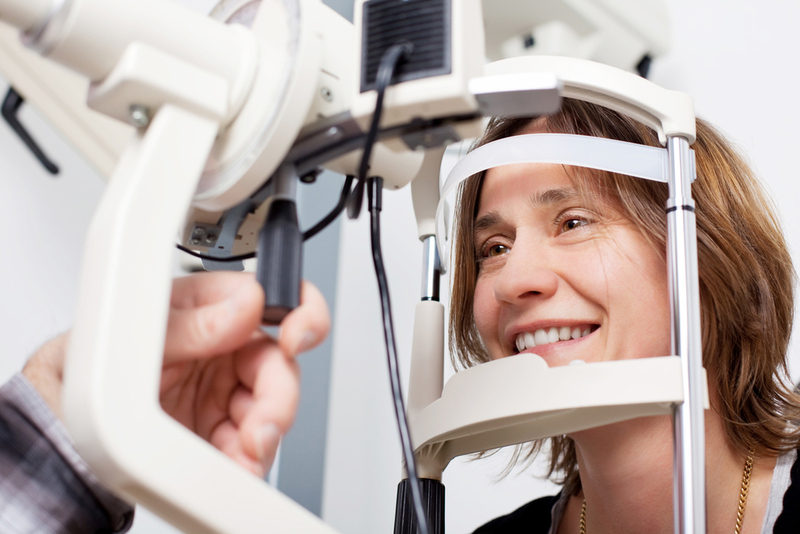 Comprehensive eye and vision exams allow us to detect those problems in time to treat them. Eye exams emphasize different issues at different stages of life. Pediatric eye exams in small children place a special emphasis on finding and correcting functional errors and health problems that might interfere with normal vision development. Annual exams for adults (and older children) place equal emphasis on function, health, and visual acuity. Senior eye exams should take place every year so we can check for age-related issues such as cataracts and macular degeneration. Physical Eye Health Exam: the external and internal parts of the eye are examined using special instruments including a slit lamp biomicroscope, binocular indirect ophthalmoscope and focusing lenses. Your pupils may be dilated with eye drops for some of these tests. Refraction: this test determines your eyeglass prescription. An important part of prescribing eyeglasses is understanding how our patients use their eyes and vision. Whether the glasses be for work or leisure, our precise measurements will get you to see as clear and comfortable as possible. Binocular Vision Testing: there is a lot more to our vision than just seeing 20/20. We also test to see how well the eyes work together by checking one’s focusing system, depth perception, and eye muscle movements. Our eye doctors use a variety of sophisticated techniques to evaluate your eyes and vision. Pupil dilation lets us examine the delicate structures of the retina, while techniques such as slit lamp testing give us a detailed view of the front of the eye. We also administer various techniques to screen for glaucoma. Easy, painless tests help us evaluate eye functions such as binocular vision. If your eyes have a refractive error that needs correcting, you’ll benefit greatly from our clinic's use of ClarifEye. ClarifEye is a digital technology that enables us to evaluate your eye refraction much more precisely than older, subjective methods. This means that our eye doctors can get your corrective prescription as accurate as possible the first time. Need to Schedule an Eye Exam in Medford, Boston, Dedham or Natick? Now that you know more our eye and vision exams, and how important those exams are for you and your loved ones, is it high time you scheduled an eye exam in Medford, Boston, Dedham or Natick? If so, call any of our locations today so we can start protecting and helping your family's eyes!